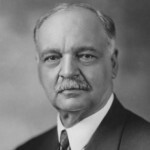 Charles Curtis was born in Topeka, Kansas. He was an American politician. He was the 31st Vice President of the United States. After serving as a United States Representative, and then a longtime United States Senator from Kansas, Curtis was chosen as Senate Majority Leader by his Republican colleagues. As an attorney, Curtis entered political life at the age of 32, winning multiple terms from his district in Topeka, Kansas, starting in 1892 as a Republican to the US House of Representatives.